You’ve spent hours working on a track in your bedroom or home studio, and after meticulously tweaking the mix, you’re pretty happy with how it sounds. But then you listen to it somewhere else - in your mate’s studio, in the car, on your phone, or even over a club PA system - and the mix sounds nothing like it did in your own room. The balance is all wrong: the bottom end is boomy, the treble is harsh, and the vocals and lead instruments are way too quiet - or loud - in relation to the other parts. Sound familiar? If so, your monitoring setup may need a rethink! So what differentiates a professional monitor speaker? Why do we need them? Wouldn’t a regular hi-fi speaker do the job? Well, no. ‘hi-fi’ speakers enhance the music played through them. They aim to impress you with exaggerated bass, overhyped midrange and pushed treble - ideal for the average listener, but not so great when you want a clear representation of your mix. In contrast, studio monitors are designed to reveal a true picture of the audio coming out of your speakers, warts ’n’ all. This uncompromising picture of your mix balance means you can make critical mixing moves, confident that what you’re hearing will translate to all other playback systems. In this respect, monitors tend to be less pleasant-sounding, and in some cases more fatiguing, than hi-fi speakers, where the tonal balance is designed to enhance music for your average music listener. Studio monitors come in all shapes, sizes and types, so it’s worth knowing exactly what you need, what you’ve got, and what you want. First up, you need to think about amplification. The electrical signals coming out of a mixing desk or audio interface are calibrated to a different level than those required by a typical loudspeaker. For that reason, almost every monitor needs the help of an amplifier, to give the signal that extra juice. That amplifier can either be incorporated within the speaker itself, in which case you have active monitors, or used separately and externally, alongside your passive speakers. In reality, the vast majority of monitors these days are active, using compact onboard Class D amplifiers, but there are notable exceptions: Yamaha’s famous NS10 is a passive design, and some high-end manufacturers, such as PMC, Amphion, ATC and MunroSonic, still produce passive monitors. For the average home studio, though, active monitors are usually far more practical, as you don’t need to choose, find, buy and place an external amp. A classic two-way speaker employs one woofer, dedicated to producing low frequencies, and a tweeter that kicks out high-mid and high frequencies. The signals are separated by a crossover filter, which, as you can imagine, splits the input into low and high bands. In cheaper monitor designs, this crossover point sits at a crucial midrange area, so many higher-end monitors feature three-way (or even four-way) designs that employ more speaker drivers, aiming to keep those key midrange frequencies free of crossovers and so clearer. As a general rule, the bigger the monitor, the more power it can output, and the more bass frequencies it will kick out. Your room’s size and how well acoustically treated it is will probably determine the size of monitor it can handle: big, loud monitors can easily overload a small space. Nearfield monitors are designed to be placed fairly close to the listener’s ears, in a typical home studio. Midfields, on the other hand, are designed to be placed further away, at a further distance apart, in a bigger room. Lastly, professional studios usually also feature giant, full-range monitors, referred to as mains. Monitor sizes are based on the woofer diameter, with that number often part of the model number - for a nearfield monitor, this can range from 3 inches to 8 inches. For most small to medium rooms, nearfields are adequate. 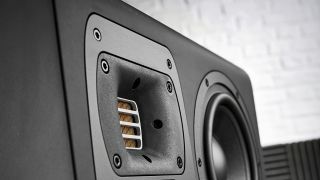 Without getting into too much technical detail, a monitor’s bass port is an exposed hole or pipe that vents air out of the monitor, and is tuned to resonate in the low end to help extend the monitor’s low-frequency response. Bass reflex ports can be either forward- or rear-facing - in the case of the latter, monitor proximity to a rear wall can be problematic, so try to avoid a rear-facing port design if you can’t position the monitors at least a foot away from a wall. Conversely, other designs eschew reflex ports - which can overhype bass frequencies and exhibit subtle distortion - in favour of a sealed cabinet, transmission line or even cardioid design, which can all give a less exaggerated, tighter bass and better low-frequency transient response. How do I connect my monitors? Active monitors can offer jack, XLR, phono, digital and/or USB connections, and they’re designed to be hooked up directly to your audio interface or computer. If your interface has balanced outputs, opt for your monitors’ balanced XLR or jack input to reduce noise. For passive monitors, you’ll need to send your interface or computer output to an amplifier and then connect that to your monitors. At the very least, active monitors also include a level control, and room-compensating EQ controls are common. We've rounded up what we consider to be some of the best monitors currently on the market, from budget speakers to pro-quality monitoring setups. As a newcomer to the studio monitor marketplace, the Berlin-based HEDD Audio - set up by ex-Adam Audio MD Klaus Heinz and his son Dr Frederik Knop - is quickly gathering a buzz. The Type 20s have a sleek, futuristic, somewhat dinky look - but their ‘cute’ size is in no way indicative of their sound! With a frequency response of 32Hz to 50kHz, their front-ported three-way design (7.2” woofer, 4” midrange driver and 1” ‘Air Motion Transformer’ tweeter) kicks out a scrumptious full-range presentation that completely blew us away. Available in 40, 50 and 65 flavours, the latter of which we’re reviewing here, the Shapes, from Focal, now sit between their budget-friendly Alpha series and the Solo6 Be - another 6.5" two-way monitor - in terms of price. Aesthetically, the Shapes are an interesting departure from Focal’s other designs. The main speaker cabinet is black-painted MDF with a luxurious walnut veneer, appearing less ‘studio spaceship’ and more ‘hi- connoisseur’ - in fact, they’d look just as at home in a domestic cinema setup as in a production environment. Interestingly, the Shapes are non-ported, with dual 6.5" passive radiators (one on each side of the monitor). The Equator D5s are much smaller than the Q series but maintain the design aesthetic; a coaxial design. Sound emanating from a single point-source shouldn't exhibit the sort of midrange phase distortion that a traditional two-way monitor design can introduce when the audio, split at the crossover, collides when radiated from the separately located tweeter and woofer. Equator believe that no two transducers have ever been manufactured with identical output characteristics and that, without the left and right speakers having the same characteristics, image shifts will occur in the stereo field. That's where some of the DSP comes in - to provide accurate voicing for each individual monitor by delivering a consistently matched output curve for every unit, that voicing being created, say Equator, by award-winning recording engineers, who referenced their hit mixes. The S2V is the smallest in the range and built around a newly developed 7” woofer with Adam’s latest S-ART ribbon handling tweeter duties. Onboard amplification is a combination of Class D (woofer) and Class A/B (tweeter) and the crossover, volume, time delay and EQ settings are handled by onboard DSP, accessed via a menu driven OLED on the back. Here you’ll also find an analogue input via XLR, a pair of AES3 digital connectors (you can daisy chain two monitors from one digital input), USB input (for use with the S-Control application), and an expansion slot for future options. At the smallest end of the Genelec 8000 bi-amplified monitor series is the 8010A. Though relatively light (1.5kg each), the 8010As are solid thanks to the die-cast aluminium enclosure, with metal driver grilles to prevent damage in transit. Portability is key, with power and input sockets neatly tucked in at the rear. They come with tiltable Iso-Pod rubber stands attached, simultaneously taking care of axis angle and transmission reduction. They feature standard 8000 series mounting sockets for a variety of options, from truss hanging to floor stands. These are rear ported (bass reflex) enclosures, and just beneath the port is a recess housing five dip switches. Three contour the low-frequency response: -2dB and -4dB bass tilts which combine for -6dB, and Desktop Control which dips -4dB at 200Hz. The BX5 has established itself as a reliable and affordable compact two-way monitor, maintaining its popularity through a number of updated and restyled versions. Its latest incarnation carries through many common features from recent editions, including a one-inch silk-domed tweeter, five inch woven Kevlar woofer (both magnetically shielded) and vinyl laminated MDF cabinet. Once again it uses a rear ported design to improve bass extension, and further rear panel elements include Volume control, XLR and TRS jack inputs and three Acoustic Space bass settings (Flat, -2dB and -4dB) to help compensate for the monitor position in the room. Much like the recent BX5 Carbon, you can connect both XLR and jack inputs simultaneously. Fluid Audio says that it prides itself on the importance of speaker imaging. Its goal is to present a realistic soundstage where you can pinpoint and place each instrument exactly where you want it to be in the mix. A dual concentric design doing its work ought to achieve that goal and, when listening to some mixes on the FX8s, it does become apparent that there is a nicely detailed soundstage. There is a very good sense of sound location across the stereo spread as well as a decent sense of space back to front. Mixing a track using the FX8s, we were able to clearly hear instruments as we panned them into position. Clarity of sound is very good across the frequency range and the 8-inch woofers, combined with the port, will give you plenty of bottom-end; although if you think it's too much for your situation, there's no bass cut facility to help sort it. Mackie’s HR Series professional monitors have over 20 years on the clock and many fans, but at over a grand a pair for the six-inch HR624 Mk2, they’re not cheap. The new XR series shaves roughly a third off that price tag and delivers a new rear-ported design with class D amplification (bear in mind the HRs use a passive radiator panel and class AB amps). Despite its less impressive bass extension, the XR624 is particularly revealing for guitar-heavy tracks, and this can be a tough test for even the best monitors. A sister product to the original single-box iLoud, This two-speaker setup is billed as "the smallest active studio reference monitoring system in the world," and is designed to be used in small "makeshift" working spaces. iLoud Micro Monitor certainly has the look and feel of a downsized 'proper' monitoring system rather than a posh pair of consumer-level computer speakers. Appearance-wise, the speakers have an appealing 'roundness' to them, and are reassuringly weighty, though they're certainly small and light enough to be carried around. There's a cable connection between the two of them, with the left-hand speaker housing all the controls and connectivity options. One of the most affordable Adam monitors to date, the T5V is built around a 5-inch woofer and Adam’s U-ART (Unique Accelerated Ribbon Tweeter) tweeter. This Class-D powered two-way design with rear-ring bass reflex is the smaller of the new T Series designs. Sonically, the top-end is very well tuned, while the HPS waveguide delivers a broad horizontal sweet spot. This contributes greatly to the overall imaging and separation, which is excellent. Although the cabinet is quite deep, front to back, the units feel compact. The low mid range frequencies could be more prominent, but this certainly isn't a deal-breaker, and by setting the LF EQ to -2dB we achieved a much better result. Adam’s desire is to make the T5V your first Adam monitor, and judging by what we’ve heard here, it could easily make you a fan for life.